New York city has many flags. The official New York city flag can trace its ancestry all the way back to the Dutch colony of New Amsterdam in the 17th century. Some of the other flags of New York City that represent the boroughs draw on designs that were in use at the same time, while others have significantly younger designs. The New York City flag has three vertical stripes of blue, white, and orange with the city's seal in the center. The three colors come from the Prince's Flag of the Dutch Republic, which flew over the city when it was founded by Dutch colonists. 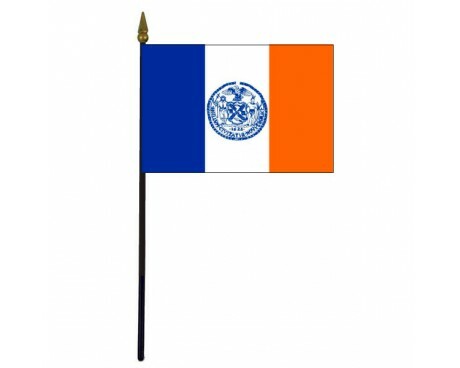 They are included on modern flags of New York City in order to honor the role that the Dutch played in the city's development. The city's seal contains a bald eagle that represents the United States, a Native American that honors the region's original inhabitants, a beaver and windmill that represent the Dutch settlers, and a set of flour barrels that represent industry. The current version of the flag came into use in 1977 and replaced an older form that used a different variant of the city's seal. Every one of the five boroughs has a flag that is in common use, but only two of them have official status. 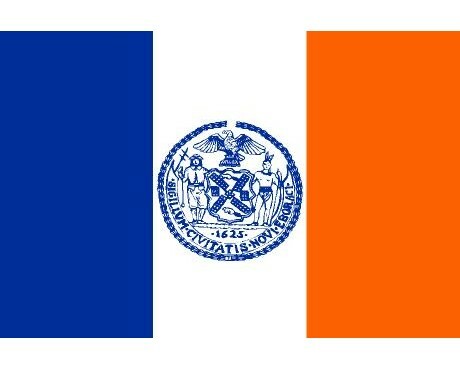 The Bronx has an officially sanctioned flag that consists of three horizontal stripes of orange, white, and blue that honor the Dutch settlers. It also contains a central emblem that is made up of a wreath encircling the arms of the Bronck family which gave the borough its name. The other official flag is that of Brooklyn, which features a white field that displays a woman bearing the fasces on a blue field. The fasces serve as a symbol of strength through unity. The other boroughs have common but unofficial designs. The flag of Manhattan has the same stripes as the city's flag, but replaces the city seal with that of Manhattan. The flag of Queens is derived from the arms of the city's first Dutch governor. It has three horizontal stripes that alternate between blue and white with a crown in the canton and crossed tulips surrounded by a ring of wampum in the center. The flag of Staten Island is the youngest flag. It dates back to 2002 and features an image of Staten Island's skyline above the sea on a white field.